“I especially ask Catholics to renew their support, love and prayers for our Coptic brethren who are enduring martyrdom for the sake of Christ,” said Bishop Joseph C. Bambera of the Diocese of Scranton, Pennsylvania, chairman of the U.S. bishops’ Committee for Ecumenical and Interreligious Affairs. In his Dec. 29 statement, the bishop also prayed for those who had been injured and killed. A Dec. 31 Associated Press report said witnesses at the scene of the attack credited local residents and worshippers for keeping the death toll down. The men and women closed an iron gate, preventing the assailant from going inside the church. Others pelted him with rocks as he fled the area by foot because someone hid his motorcycle. One resident is said to have pounced on the gunman while he was reloading his automatic weapon. The attack began just as Mass ended at the Mar Mina church in the southern Cairo suburb of Helwan. Some people took shelter in an adjacent stationery store. Initial reports said there was more than one gunman, but updated reports confirmed it was one assailant who was shot and wounded by a police officer. 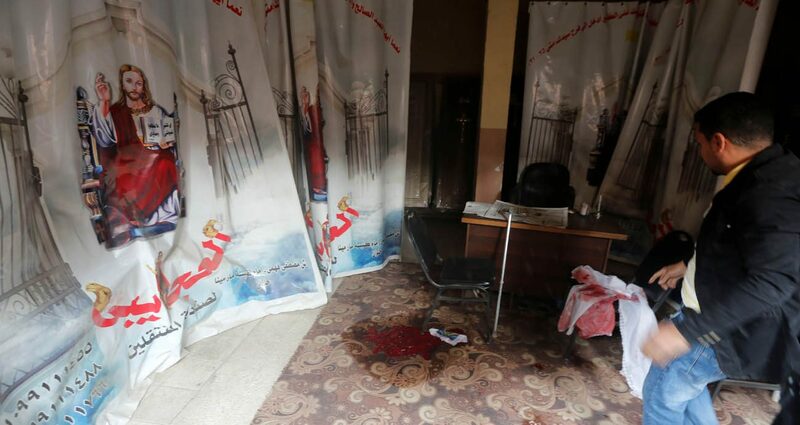 The attack was claimed by the Islamic State group, which has specifically targeted Egypt’s Coptic Christian minority since December 2016 with a series of church bombings that have killed more than 100 people and wounded many more. Bishop Bambera’s statement noted there have been more than 2,000 attacks on Coptic Christians by extremists in the past three years. He recounted recent attacks this year, including the Dec. 22 attack on a church south of Cairo that wounded three people and destroyed the church’s interior. In May, masked militants opened fired on a bus packed with Coptic Christians, including children on their way to the monastery of St. Samuel the Confessor in Maghagha, killing 28 and wounding 22. The bishop also noted the Palm Sunday attack when suicide bombers struck churches in Alexandria and Tanta, killing 43 people and injuring dozens. “These attacks represent only some of the many attacks that have occurred over the past several years, targeting faithful of the Coptic Orthodox Church, who account for almost 10 percent of Egypt’s population,” the bishop said.